Technology continues to play a large part in modern business and we are only at the tip of the iceberg in terms of how Big Data will impact Professional Services. This article will focus on 3 very practical and achievable examples of how firms are using Big Data to drive Business Development and Client Retention. Most commercial firms are comprised of very well connected and highly regarded professionals. These professionals have extensive client, contact and referrer networks. Communication data reveals that it is not uncommon for a firm to have a known network of around 500 unique external contacts for each staff member they employ, with some senior professionals having active communication with upward of 2,000 external contacts across 1,200 unique businesses. A known contact is far more likely to choose a firm where they have an existing relationship and the cost of acquiring this work is far less. 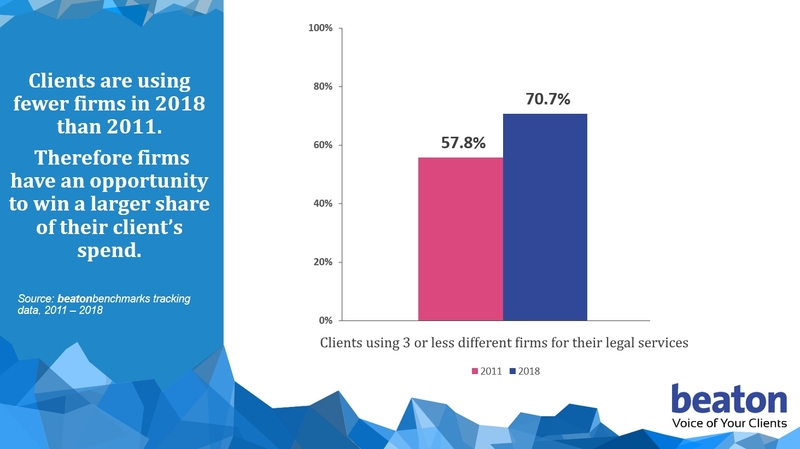 Further highlighting the importance of capitalising on your known network, according to beatonbenchmarks tracking research 2011-2018, clients are using fewer different firms today than they were in 2011. 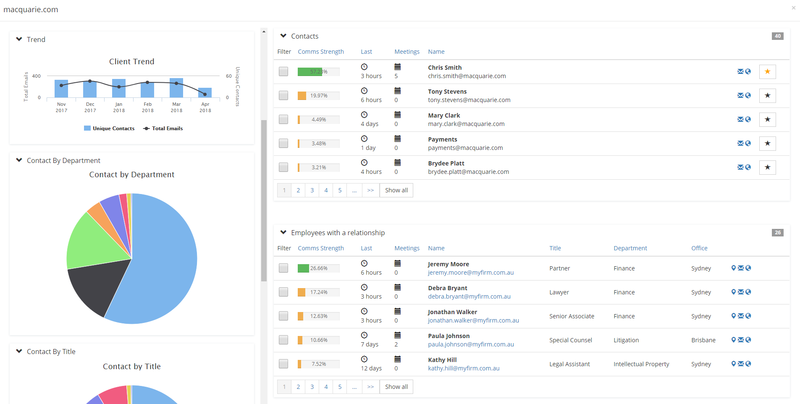 Connecting to multiple data sources, Client Sense automatically captures known and active contacts, allowing you to easily add the relevant records to the appropriate communication and mailout lists. Having a live and accurate list of contacts can also help to clean up existing client databases, develop accurate invite lists and maintain legacy CRM database records. Where firms are still relying on busy professionals to manually enter CRM data, it is not uncommon for those firms to actively capture less than 20% of their known client, contact and referral network. Without the visibility and oversight that automatically collected communication data can provide, it can be near impossible to detect the types of trends that can spell a reduction in fees, or the loss of a key client. Managing key client relationships is critical, in many cases, upward of 80% of a firm’s revenue will come from less than 20% of their clients, so these relationships are of the utmost importance to the firm’s financial stability. Client Sense automatically analyses communication trends in real-time, providing an early indicator of a potential reduction in revenue. Communication metrics are often the lead indicator of client revenue trends. The depth of a relationship, the number of active contacts your firm has within a client organisation, their seniority and the number of distinct practice areas with an active relationship, are often the lead indicators ahead of client revenue. Smart Collaboration: How Professionals and Their Firms Succeed by Breaking Down Silos published by Heidi K.Gardner covers this particular correlation in depth. When the data can be automatically visualised in real-time and shown as a trend, these metrics can often flag the early signs a deteriorating relationship and a subsequent reduction in fees. Most firms at some time have had to face the challenges presented when a key staff member leaves or plans to leave the firm. Succession planning is becoming a significant concern for many firms as many senior staff reach retirement age and others are less likely than ever before, to spend their entire working career within just one firm. These challenges are discussed in this article Law Firm Succession Planning – Preparing for the baby boomer retirement wave published by Bruce Lithgow and Brian McMahon – Major, Lindsey & Africa. Client Sense can be used to quickly and easily flag and monitor ‘relationship transitions’. By actively and automatically monitoring these relationship transitions, the real-time progress of these handovers can be viewed and measured. Monitoring and tracking this progress ahead of the planned departure, reduces the risk of having these relationships dissolve following the departure of a key staff member. IMHO Client Sense has all hallmarks of a break-through idea. Very pleased our FirmChecker platform is partnering with you.